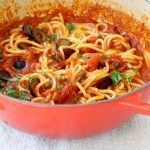 Best ever, this vegetarian mushroom Bolognese sauce is easy, hearty and tastes like the real thing. 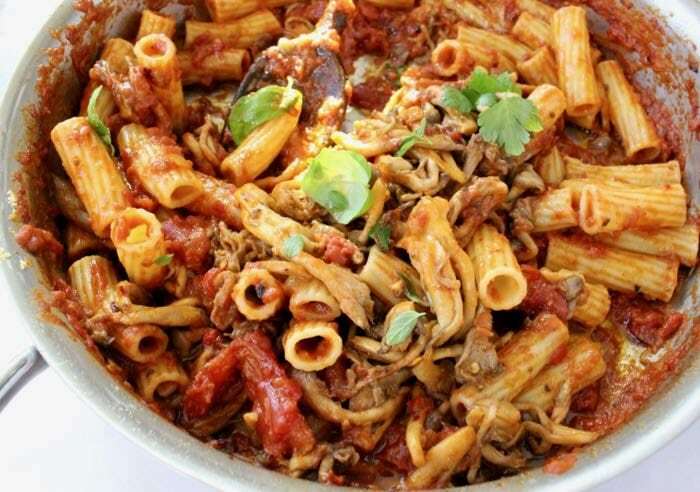 Made with wild mushrooms, roasted peppers, eggplant (aubergine) and meaty San Marzano tomatoes. 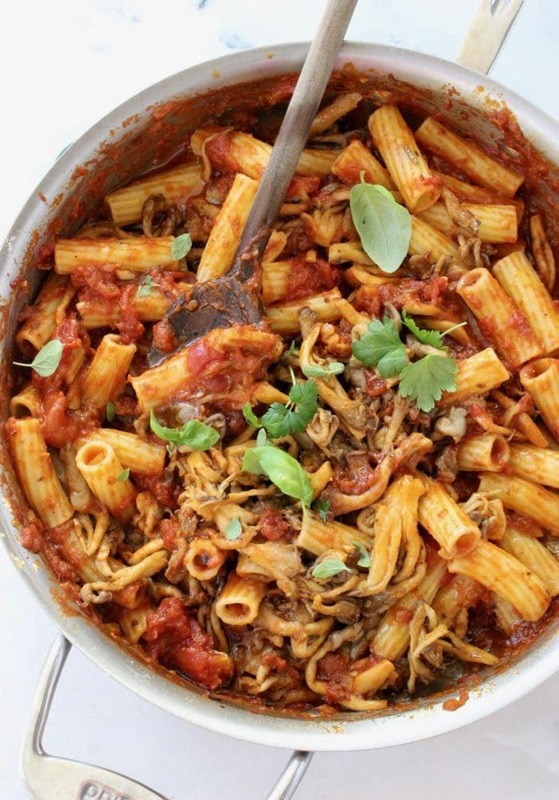 The smoky layers of flavor in this dish are reminiscent of a traditional homemade, slow cooked meat sauce from Bologna, but it is 100% vegan and plant based. 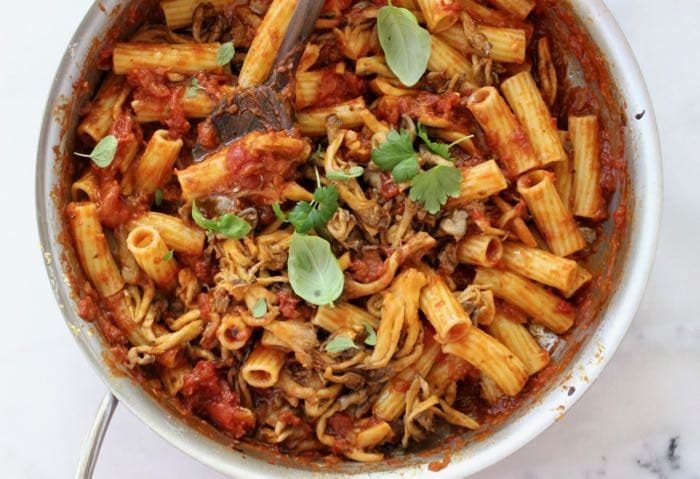 Easy and healthy, toss it with your favorite whole wheat pasta, fettuccine, rigatoni or bucatini for a perfect weeknight dinner. Wanna make it gluten free but aren’t too fond of brown rice pasta like myself ? Worry no more my friends. I’ve come across this organic, Buckwheat Italian pasta ( <—amazon affiliate) that tastes like the real thing but it is gluten free and wheat free. Yes, buckwheat is actually a seed also called an ancient grain but it isn’t really a grain. Kind of like tomatoes are a fruit, but actually really a berry, not a vegetable. I hope that makes sense. Really hearty and nutritious! 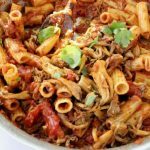 You can serve a crowd of about 8 to 10 people with this recipe, so best thing to do is to portion it into freezer bags or containers and save for later. We go through a batch of this in 3 days because we pack lunches and don’t mind eating leftovers. Lifestyle Update: We Are Going Plant Based! Believe it or not, both the Batman and I are going on a whole food plant based diet and lifestyle, just like that! Yes, the man who told me he would never stop eating meat as soon as I became a vegetarian, so I didn’t even bother trying to change his mind. Pinky promise and everything! I swear on my saffron! So here we are, building a wholesome plant based / vegan pantry, restocking the refrigerator with in season produce, legumes and fruits. I suspect there will still be the occasional appearance of an organic free range egg during the holiday season, in a cake and even for breakfast sometime. Preheat a large cast iron plate and roast the eggplant and bell peppers until charred all over. Transfer to a bowl, cover with plastic wrap and allow to cool. Once cool enough to handle remove the charred skins. Scoop the flesh of the eggplant into a bowl and transfer to a food processor. Process until a nice chunky rustic texture is achieves. Peel the bell peppers and add them to the bowl of a food processor. Purée until you attain a rustic texture. Refrigerate until needed. Rinse and slice the Mushrooms if needed, depending on the variety you use. In a large pot over medium flame add a lug of olive oil and the onion. Give it a good stir and add the mushrooms with a good pinch of sea salt. Cook until the moisture is almost all reduced. Add the red wine and stir well. Simmer until reduced by half, about 5 minutes. Add the roasted eggplant and bell peppers to the pot together with the bay leaf and bring to a simmer. 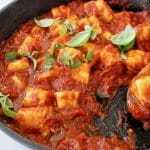 Use your hands to crush the tomatoes while maintaining some rustic chunks for texture. Stir and bring to a gentle simmer. Partially cover with a lid and cook for about 45minutes to 1 hour until the sauce had reduced to your liking. Meanwhile bring a large pot of water to a boil. Add a good amount of sea salt. (the water should taste like sea water). Add the Rigatoni and cook according to the directions on the box. Drain the pasta and toss with the sauce. 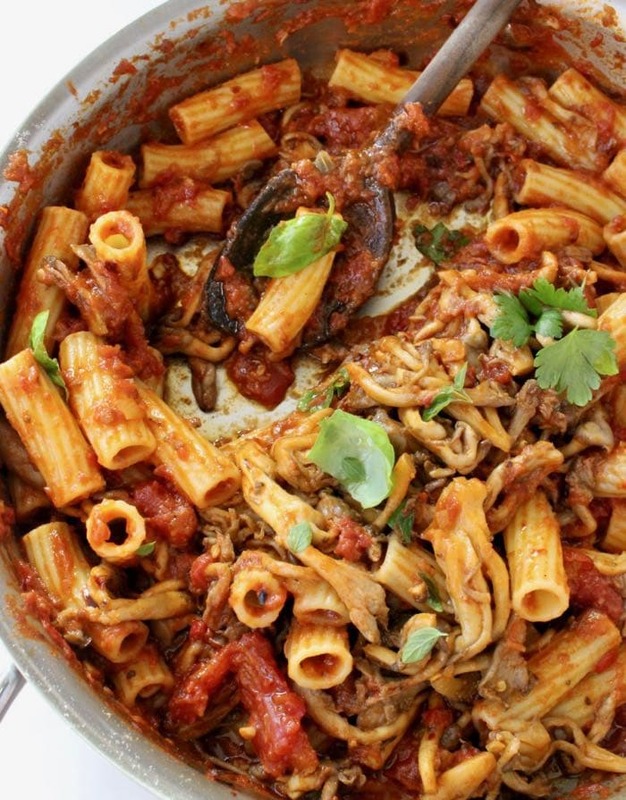 Serve with the fresh herbs and reserved Mushrooms on top. 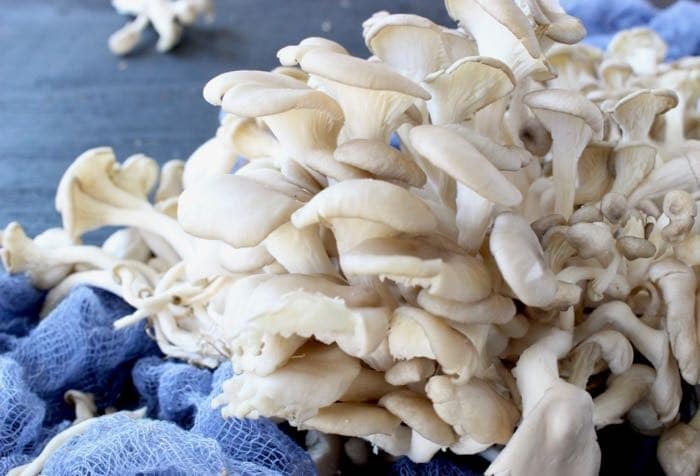 I used oyster mushrooms, they have a little bit of a chewy texture reminiscent of squid, so make sure you like both the flavor and the texture when choosing your mushrooms for this dish. This sauce was amazing. Ended up freezing half of it as it makes a big batch but so glad I have all that waiting for my future self. Looking forward to trying it with the Buckwheat spaghetti next. Thank you! My hubby & I watched the documentary last night & he feels the same as your husband. Giving up meat won’t be a problem, I’ve been cooking more vegetarian lately. I’m not sure about giving up cheese & butter! I will definitely be following your journey and trying your recipes. Thanks! 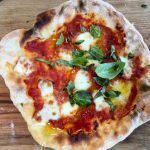 Hi Florentina (love your name) – I’m a new fan to your blog and can’t wait to try many of your recipes. I’m also a HUGE fan of ricotta so your common love for it drew me in…lol. Need a little help with two steps of the instructions. Is a cast iron plate similar to a cast iron grill/griddle pan? I’m trying to better understand the roasting method you have noted. Also, for Step #9, after crushing the tomatoes, they go right in the eggplant/mushroom mixture right? Thanks for any clarification.